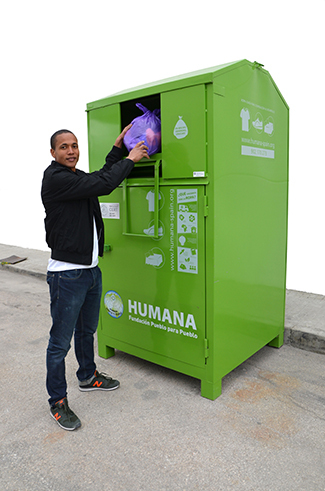 Humana collected last year 17,629,081 kgs of used clothes and footwear in the 5,209 containers that are installed in Spain. This amount is similar to that of 2013 (17.606.050 kgs). The Foundation collected in 2014 an amount slightly higher than in 2013, despite the difficult socio-economic context in which we live clothes. This is because citizens are increasingly aware that clothing can have a second life and the reuse and recycling are fundamental to protecting the environment. It is the result also of the work performed daily municipalities and organizations like ours. It is estimated that a person buys approximately 16 kg of clothes and a significant percentage rarely used ... until it ends its life in the trash or in a container of textile waste, in the best case. Of all garments Spanish discarded each year, only one in five is deposited in a container of textile waste or delivered to a specialized recycling organization. A high percentage of clothes that no longer serves us can be used again, reducing the volume of waste. Because if the clothes are already produced, why destroy it and produce it again? 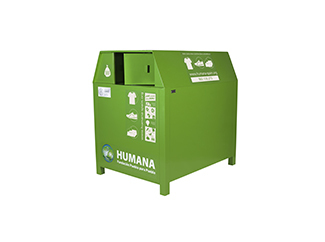 Humana efficiently handles donations of used clothing and encourage reuse and responsible consumption. It is a shared purpose for Waste Framework Directive and Agriculture, Food and Environment Ministry (MAGRAMA), whose priority is to reduce waste generation at source and increase preparation for reuse and recycling of household waste and similar. Reuse and recycling textile contribute to environmental protection: each kilo of clothing is reused and not incinerated prevents the emission of 3.169 kg of CO2 according to the European Commission. The collection of clothing is a free service to the town and signifies an important step in the cost of collection and disposal of urban waste savings. In addition, any citizen can quantify their contribution to the environment by depositing a bag of used clothing in the container through the calculator of Spanish Association of Social Solidarity Economy (AEREES), a tool that allows you to enter the number of garments translation reuse and CO2 emissions avoided. Along with its environmental component, used textile management is an important engine of development. On the one hand, as a generator of employment in Spain: the Foundation currently has 450 employees (ie, Humana generates a full time permanent job for every 40,000 kilos of clothes collection). And secondly, because the proceeds from textile management made possible social assistance programs and awareness in Spain and development cooperation in the South.